Movie Poster and Trailer Revealed for Butter. Jennifer Garner, Olivia Wilde, Ty Burrell and Hugh Jackman star in the Weinstein Co.’s satirical comedy. 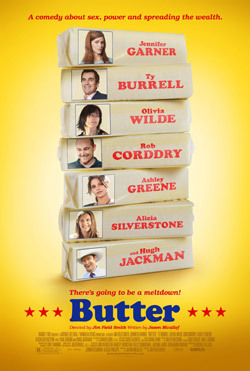 See the movie trailer and poster for Butter below. In small-town Iowa, an adopted girl (Yara Shahidi) discovers her talent for butter carving and finds herself pitted against an ambitious local woman (Garner) in their town’s annual contest. Running Time: 1 hr. 31 min. MPAA Rating: (R) for language, sexual content and brief drug use. 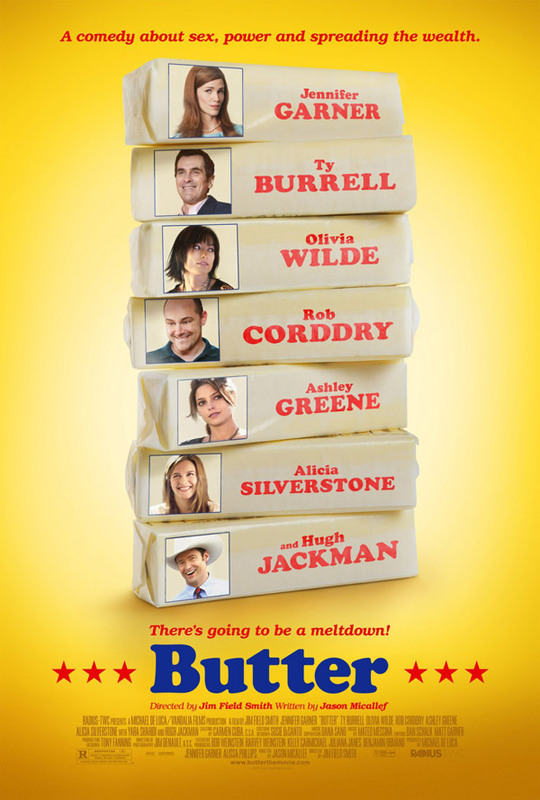 Set in the highly competitive world of championship butter carving, “Butter” blends social commentary, outrageous comedy and heartfelt drama in telling the story of the ambitious Laura Pickler (Jennifer Garner), the self-anointed First Lady of Butter Carving. Refusing to accept that her husband (Ty Burrell) wants to step down after his 15-year run as the “Iowa State Butter Carving Champion,” and therefore end the Pickler family’s reign in the spotlight, Laura takes a stab at the title herself. But her bid for glory is complicated when two unlikely contestants enter the race – one, her husband’s hard-living mistress (Olivia Wilde), and the other a 10-year-old foster child named Destiny (Yara Shahidi). Enlisting the help of her high school sweetheart, Boyd (Hugh Jackman), Laura will stop at nothing to be crowned champion, even if it means resorting to sabotage. Part political satire, part Capra-esque comedy, “Butter” is a story about what it means to win at all costs and against all odds.